August means Winter is almost over and we celebrate it at the Mercedes Benz Fashion Week Joburg where Summer and Spring was already in full swing. For us, the defining feature of the week was the “Fast track” fashion show featuring young, innovative designers paired with celebrities to create some electrifying ranges. Minnie Dlamini and Tayla Mgukos’ collaboration is titled ‘Courted’. Tayla’s speciality of knitting came through in open tops paired with mini skirts for ensembles as feminine as they were edgy. Designer Buda Malete and DJ Tira brought a collection in corduroy, layered pieces, viscose jackets and boho hats. One for confident, liberated men unafraid to embrace the alternative. 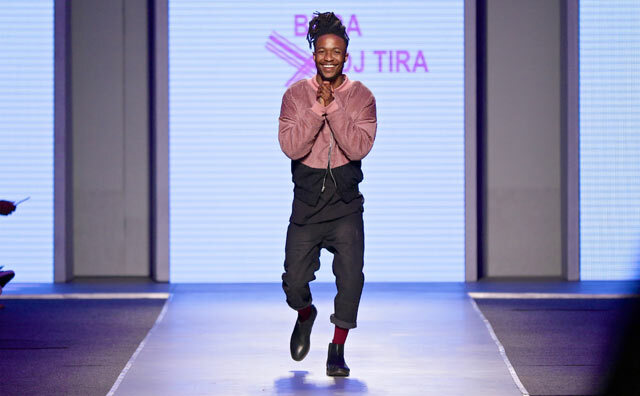 Buda and DJ Tira’s Afro Street collection is an adventurous call on the direction in which they see African fashion developing. As for Chesney Williams and DJ Zinhle, their vision of bohemian meets street was an instant hit. This primary, colour-blocking make-up with echoes of Native American ritual painting was a surefire way for Nandi Mngoma to get our attention. She called her collection Colour and it delivered on all it promised. Collaborating with Nandi brought out Inga Madyibi’s best in fascinating cuts, varied textures and a fresh approach to colour. It was a week in which the crowd were more often on their feet giving vocal standing ovations rather than sitting and clapping politely. These collections had tapped into an excitement and pride at what it is to be African.